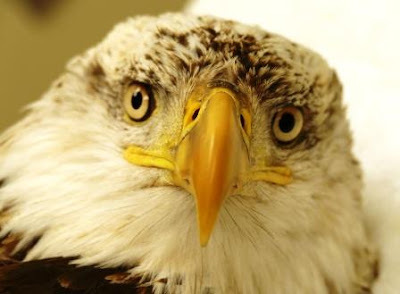 On Sunday, a bald eagle patient from the Mankato, MN area was brought into The Raptor Center’s clinic. The bird had been spotted tangled by its left wing from some fishing line, floating in the Minnesota River. While the eagle’s wing is recovering from the entanglement, its blood work and physical exam showed that it was recently exposed to (ingested) lead. Because lead toxicity is commonly seen in bald eagles, every eagle admitted to TRC’s clinic has its blood tested for the presence of lead. While lead toxicity is often fatal to eagles, this bird’s other problems (fishing line entanglement) resulted in it getting treatment at an early stage of the disease. The bird, like all of our clinic patients, had an important environmental message to tell us. On average, 25-30% of the bald eagles admitted suffer from lead toxicity. The primary cause of lead toxicity in bald eagles is ingestion of bullet fragments (hunting ammunition) in a meal such as a deer carcass or gut pile. Lead poisoning has long been recognized to be a serious problem in bald eagles admitted to The Raptor Center. Dr. Julia Ponder, TRC's executive director, is featured in this Undark article, discussing the impacts of spent ammunition on wildlife.